Between 1897 and 1908, five Irish-bred horses captured nine English classic races, including three Derbies, two St. Legers, and two editions of the One Thousand Guineas. The horses were Pretty Polly, Rhodora, Orby, and the half-brothers Ard Patrick and Galtee More. These Irish-breds proved not only equal to, but often superior to their English contemporaries. Galtee More, the senior member of this quintet, landed the English Triple Crown with near contemptuous ease. His sale to the Russian government and later to Germany, allowed him the opportunity to become a leading sire in both countries. The breeder of Galtee More was Captain John Gubbins, a burly, charismatic, and affable Irishman. An enthusiast of horseracing, steeplechase races in particular, from an early age, Gubbins rode many winners over hurdles in Ireland as a young man. For many years he was master of the Limerick Hunt. His elder brother, Stamer, a giant of a man at six feet six inches, was also a horse breeder, owning a stud at Knockany in the Golden Vale of County Limerick. When he died in 1879, the property was passed to younger brother John, who had owned the adjacent Bruree Stud since 1868. The latter sold off the majority of the breeding stock, save for a Xenophon--Lena Rivers colt that was deemed too weedy to be sold. Named Seaman, the colt repaid his owner by winning the Grand Course de Haies d'Auteuil in France. As a devotee of jumping races, Gubbins enjoyed considerable success in breeding chasers and one of his mares, the famous half-bred May Day (Family H-B 1), became an important foundation mare of a family of renowned jumpers. With two studs at his disposal, Gubbins continued breeding jumpers and then decided to try his luck at breeding runners for the flat. One of the mares he acquired for this purpose was Morganette, who became May Day's paddock mate for years, and shared a grave marker with her after their deaths. Morganette (1884), bred and raced by J.H. Houldsworth, was a plain brown filly, described as "mean looking and muley." She made only one start, finishing unplaced in the Prince of Wales's Stakes at Goodwood. Found to be a roarer, she was retired and promptly offered for sale. Captain Gubbins was not put off by her dismal racetrack performance, her unappealing appearance, or her wind infirmity. Despite her shortcomings, she had a beautiful pedigree, by the brilliantly fast Springfield whose offspring included One Thousand Guineas winner Briar-root and Derby champion Sainfoin, and out of Lady Morgan, who was by Derby winner Thormanby and out of Morgan-la-Faye, a half-sister to Oaks and St. Leger winner Marie Stuart. To Gubbins, that was all that mattered. Accounts vary as to how much he exactly paid for her, but it was between £200 and £600. Gubbins also stood two stallions: St. Florian, the sire of Morganette's son Ard Patrick, and Kendal, who got Morganette's Irish Derby-winning son, Blairfinde, and Galtee More. Gubbins acquired Kendal, a brilliant juvenile, in 1887 for £3,000. In addition to Morganette's sons, he got Irish Derby winner Roy Neil, Doncaster Cup winner Laodamia, and half-bred daughters, such as Meanus and Kendal Belle, that became the dams of notable jumpers. In 1893 Kendal went back to England, sold for 20,000 guineas to James Platt. In 1901, age eighteen, he was sold to Ojo de Agua in Argentina, dying there in 1908, the year he led the Argentinian general sire's list. Galtee More was a member of Kendal's last Irish foal crop. He was named after the highest peak in the Galtee Mountains overlooking the Golden Vale. Galtee More was a solid bay and praised by many for his beautiful conformation, with the exception of being somewhat high from the hocks to the ground. Well over sixteen hands, the colt was blessed with immense bone and strong shoulders and hindquarters. Observers commented on his balance and symmetry. Despite his size and strong build, Galtee More came to hand early, and emerged as one of the two best juveniles on the English turf in 1896, the other being Lord Rosebery's brilliant Donovan colt Velasquez. Galtee More was sent to the Beckhampton yard of trainer Sam Darling, Sr. Gubbins previously utilized the training services of Mr. Jousiffe and Mr. Lushington, whose stables were at Telscombe in Sussex. Though these gentlemen trained many winners for Gubbins, it was not until he entrusted his racing stock with Sam Darling that his flat racing fortunes were truly made. Galtee More won his debut in the Hurstbourne Stakes at Stockbridge with ease. In his next start, he was severely tested. This was in the Lancashire Breeders Stakes at Liverpool, where, in a driving finish, he finished in a dead heat for second with Glencally, both colts only a head behind the winner Brig. From then on, Galtee More was virtually unbeatable. In succession, he took the Molecomb Stakes at Goodwood, the Rous Plate at Doncaster, and the Middle Park Plate at Newmarket. In the latter race, Galtee More vanquished Lord Rosebury's Velasquez while receiving three pounds, calling into question which was the better colt. The classic season of 1897 settled the question. The connections of Velasquez were convinced their colt was the superior individual, and both colts progressed well over the winter. Galtee More's powerful frame filled out, so that by the time of the first classic of the season, the Two Thousand Guineas, it was obvious it would take an exceptional horse to beat him. In the race itself, Galtee More easily defeated his rival by four lengths, and soon after added the Newmarket Stakes as a prelude to a rematch in the Derby at Epsom. Prior to the Derby, trainer Darling was made aware of rumors that his horse might be got at, and he acquired a large Newfoundland retriever as a guard dog. The journey to Epsom from Beckhampton was long and exhausting, as Galtee More's train was shunted into sidings to let other trains pass. When he finally arrived at Epsom, Galtee More was housed in a stable that was in dire need of several barn cats, as it was infested with rats. Despite all this, Galtee More, partnered by Charles Wood, won effortlessly by two lengths from Velasquez. Galtee More and Velasquez never met again. Velasquez would later take the Princess of Wales's Stakes and Champion Stakes, both at Newmarket. Galtee More followed up his facile victory in the Derby with wins in the Prince of Wales's Stakes at Ascot, the Sandringham Cup at Sandown, and the St. Leger at Doncaster, for a sweep of the Triple Crown. His last victory came in the Sandown Park Foal Stakes. In his last start of the season, Galtee More failed to tote 132 pounds, up to twenty-six pounds more than his rivals, in the Cambridgeshire Handicap. Rider Jack Watts maintained Galtee More might have won had the colt not been sore and shortening stride because of it during the downhill portion of the race. The Cambridgeshire turned out to be the last performance of Galtee More on the turf. Trainer Sam Darling was always concerned about his charges tendons, recollecting "Galtee More had a thickening of the tendon under the knees; this at different times caused me no little anxiety, and in the end, was the cause of my not training him as a four-year-old for the Gold Cup at Ascot." All told, Galtee More won eleven races and £27,019 in prize money. In part due to the accomplishments of Galtee More, his sire, Kendal, vaulted to the top of the leading British sire's standings for 1897. As for Galtee More, his future hung in the balance when his owner, Captain Gubbins, who was never averse to a good business proposition, entered into negotiations with a Russian contingent to sell his Triple Crown champion. For decades, the Russians had imported thoroughbred stallions and mares from England and France. One of their early acquisitions was English St. Leger winner Soothsayer. However, in those early days, the objective of the Russians was not to perfect the Russian Thoroughbred for racing purposes, but to improve other native Russian light horse saddle breeds, particularly those used for the military. Tsar Alexander I, in 1819, formed a committee of cavalry and artillery officers whose job it was to oversee the management of the state studs. By the reign of Alexander I's younger brother, Tsar Nicholas I, this committee had evolved into the Imperial Horse Breeding Board and the first Russian Stud Book was published in 1836. In 1857 this board came under the direction of Count Vorontsov-Dashkov, who conceived of the idea of installing state-controlled pari-mutuel machines at Russian tracks and for deductions to be made for the advancement of breeding both the Russian thoroughbred and trotters. The importation of quality representatives of both breeds continued under the direction of Count Vorontsov-Dashkov. Thus, Prix du Jockey Club winner Clover, Hardwicke Stakes and Prince of Wales's Stakes winner Shaddock, and Doncaster Cup winner Carlton came to serve stud in Russia, as did American champion trotter Cresceus. It was Vorontsov-Dashkovs successor who engineered the deal bringing Galtee More to Russia. In 1896 Tsar Nicholas II appointed a new Director of the Imperial Horse Breeding Board. This was the Grand Duke Dmitri Konstanovich. The Tsar affectionately referred to the Grand Duke as his uncle, but he was in actuality the first cousin of the Tsar's father, Alexander III. It was a familial connection that would cost the Grand Duke his life at the hands of the Bolsheviks only months after the murders of Tsar Nicholas and his family. The acquisition of Galtee More was one of the Grand Duke's first priorities. Long-time bloodstock consultant William Allison, at the time representing the International Horse Exchange, was engaged by Grand Duke Dmitri Konstanovich to consider several stallion prospects, eventually settling on Galtee More. The Grand Duke then sent a delegation of three men, including the wealthy and eccentric vodka distiller General Arapov, to negotiate the terms of sale with Captain Gubbins. There were some humorous incidents regarding the negotiations, including one in which General Arapov absconded with a picture of Galtee More from the house of trainer Sam Darling after being overwhelmed with emotion upon seeing Galtee More gallop, and another in which the hedonistic Russian general mistook the female patrons of a restaurant Captain Gubbins took the Russians to celebrate the closure of the deal as paid escorts. Perhaps not surprisingly, Gubbins, suffering from painful gout which often made him irritable, and whose general health was beginning to decline, was not amused by the antics of the prospective buyers of his prize colt and came close to canceling the deal. After some calm reflection, Mr. Gubbins, went through with the deal, with Galtee More going to the Russians for the enormous sum of £22,500. Galtee More was installed in his new home at the state stud of Janov, some twenty miles from the town of Biala and only a few hours from Warsaw, Poland, then a part of the Russian Empire. The money the Russian government spent proved well worth it, as Galtee More proved himself the pre-eminent Russian stallion of those first few years of the new century. The most famous of Galtee Mores offspring sired during his years in Russia was the bay colt IRISH LAD (1900), one of three top-notch performers he sired that were out of the mare Lassuk, a daughter of the Austrian-bred Buccaneer stallion Vederemo. This son of Galtee More is not to be confused with the American stakes winner of the same name, foaled in the same year, who stood stud in France at Herman Duryeas Haras Gazon. Galtee Mores son IRISH LAD was the best three-year-old in Slavic Europe during the 1903 season, his victories including the Przewodniczacego Rady Pantstwa (Polish Derby) in Warsaw, the Bolszoj Vserossijskij Priz (Russian Derby) at Moscow, and the Gosudaryni Imperatricy, also at Moscow. IRISH LAD was trained by young American John O. Keene, who left America as a young man to embark on a career as a trainer. Keene enjoyed much success in Russia as a trainer for Tsar Nicholas II and members of the Russian nobility. As a trainer in Japan, one of his charges won the Japanese Derby, the purse being the equivalent of $100,000. Upon returning home to Kentucky, he built Keeneland Stud, the architecture of the buildings based on the stonework of the medieval castles he admired so much during the time he spent in England. The Depression forced the former conditioner to sell his stud to a group of horsemen, laying the foundations for the famed Keeneland Racecourse. IRISH LAD was partnered in his races by American ex-patriate Carroll (Carl) Mitchell, Americas leading jockey in 1900. IRISH LAD'S victory in the Russian Derby was worth 40,000 rubles, the equivalent of $21,200, more than three times the value of the Kentucky Derby. IRISH LAD was one of the best horses trained by Keene, under his tutelage becoming the highest money-earning Russian Thoroughbred up to that time, his three-year-old earnings alone amounting to 109,000 rubles. IRISH LAD, like many horses of the pre-war and World War I eras, is difficult to assess as a stallion, as Thoroughbred breeding was severely compromised because of the world war and the 1917 revolutions. Many records were lost. IRISH LAD sired the chestnut colt Arashan (1909). Arashans biggest score came in the Nagroda Przychowku, now called the Nagroda Iwna, at Warsaw as a three-year-old, as well as the Nagroda Rulera (Polish Two Thousand Guineas). There are no extant records to show if Arashan sired any progeny. Two known daughters of IRISH LAD bred on. Arka became the second dam of the brilliant Polish filly Fala, winner in 1927 of three Polish classics, the Nagroda Liry (Polish Oaks), Polish Derby, and Nagroda Rulera. IRISH LAD'S daughter Fantina became the second dam of Falstaff, winner in 1924 of the Polish Derby and Nagroda Przychowku. 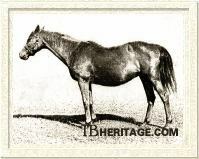 The second Galtee More—Lassuk offspring was the chestnut colt KAROLYI (1901). Like his elder brother, KAROLYI took the Polish Derby and the Gosudaryni Imperatrici at Moscow. At four, KAROLYI was a winner of the Nagroda Prezedenta Rzeczypospolitej at Warsaw. A new jockey on the Russian scene in 1904 was American Jimmy Winkfield. Having won the Kentucky Derby in 1901 and 1902 with His Eminence and Alan-a-Dale, respectively, Winkfield took his tack to Russia in hopes of achieving the level of success of other Americans who had gone there before him. As the most famous American rider to emigrate to Russia at that time, Winkfield was treated like a celebrity and his services were eagerly sought not only by the Russian nobility, but by Tsar Nicholas II himself. The young African-American was delighted with his life in Russia. One Armenian oilman for whom he rode not only gave Winkfield a large salary, but ten percent of the winnings, as well. Winkfield made a lot of money and later observed, "Before the Revolution, that was a good country. And I never had to pay no income tax." Jimmy Winkfield earned every penny, for he wasted no time in proving himself one of the top riders in the Russian Empire, guiding KAROLYI to his victory in the Polish Derby and Miss Churchill to a victory in the Polish Oaks. Winkfield enjoyed success riding in Germany, as well. The 1917 Russian Revolution necessitated his leaving Russia and he settled in France, becoming successful there before his retirement from riding at the age of fifty in 1932. GALILEJ (1902), a brown colt out of Lassuk, came next. At three, he was a winner of the Gosudaryni Imperatrici at Moscow and third to another Galtee More son, GALTEE BOY, in the Polish Derby. 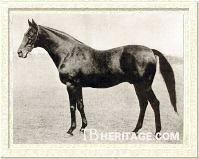 His best representative as a sire was the colt Galust, winner Russian Derby in 1914. As with the aforementioned ARASHAN, FALSTAFF, and KAROLYI, there are no records of any progeny by Galilej. GALTEE BOY (1902) was a brown colt out of the Pellegrino mare Milanaise. As a three-year-old partnered by Jimmy Winkfield, he captured the Polish Derby and the Nagroda Przychowku. A disappointment at stud, he did sire Allegro, a black colt foaled in 1913. Allegro made no recorded starts and was sent to the newly-formed Kingdom of Yugoslavia after World War I. His best performer was Great Hope, winner at three in 1933 of the Jugoslovenski Trial Stakes and Jugoslovenski Derbi, both at Belgrade. Hammurabi HAMMURABI (1903) was a bay colt out of Galciona, by Gayarre. His major victories came in the Russian Derby and the Gosudaryni Imperatrici at three. He was foaled in the same year as the German-bred son of Gallinule of the same name. Hammurabi was ambitiously sent to England to compete, but the results were mixed. He won two plates at Kempton Park and then was sent for the March Stakes at Newmarket. The race was won by Lord Cadogans Succour—with Hammurabi trailing the field. Further plans to race Hammurabi in England were abandoned and the colt was returned to Russia. The stud career of Hammurabi was undistinguished, yet through a daughter of his son Gvido (1914), his blood persists in Russia and Lithuania to the present. GAVOTTE (1905) and GALOP (1905) were each classic winners for their sire. Gavotte, a chestnut daughter of the Gallinule mare Vira, was a winner of the Polish Derby, the Nagroda Przychowku, and the Nagroda Liry (Polish Oaks). Her younger half-sister, the Desmond filly Divine, would emulate her by winning the Polish Oaks and Derby less than a decade later. An initial disappointment at stud, Gavotte was later notable as the second dam of Polish Oaks winner Harmonja, whose daughter, Piano, was victorious in the Polish Derby. GALOP, a bay colt out of the Radieux mare Potiche, took the Russian Derby with Jimmy Winkfield aboard after a grueling battle through the stretch with Koreshok, ridden by another American, Herman Radtke. In winning the Russian Derby, GALOP became his sires third and final winner of the Russian classic. GALOP was not successful but a few of his daughters bred on, notably Garonna, ancestress of Russian Oaks winner Epoha. ERZERUM (1901) was a Polish-bred chestnut colt out of Nanine, by Fontainebleau. As a three-year-old, he took the Nagroda Przychowku and was third to Karolyi in the Polish Derby. His stud record was not notable. PRINCESSA LOUISA (1903), was a chestnut out of Lady Wharles, by Charibert. Her principle victory came in the Priz Rieki Wolgi at Moscow as a three-year-old. She had no recorded progeny. Galtee More offspring won three Russian Derbies, four Polish Derbies, and a winner of the Polish Oaks. Given this level success, it would seem surprising that the Russians sold Galtee More to the Germans in 1904 for £14,000. But when the political situation in Russia at the time is taken into consideration, the decision to sell him was not so surprising. Political unrest was rife in the country in 1904, as Russia was being severely humiliated by the Japanese in the year long battle for Port Arthur off the Liaodong Peninsula, a conflict that came to be known as the Russo Japanese War. Russia was also in an economic depression. Bloody Sunday in January of 1905, in which hundreds of striking workers were massacred after a peaceful attempt to petition the Tsar at the Winter Palace in St. Petersburg, led to the Revolution of 1905. Russia was not the place for valuable bloodstock at this time and many animals were sold. In the short time Galtee More stood stud in Russia, his progeny were dominant in Russian stakes. His name was found in Russian pedigrees for decades, including important Russian performers such as Anilin (1961, descended tail-female from a daughter of GALTEE BOY), the first Russian-bred to take on and defeat the best western horses in winning the Preis von Europa in Germany three times, as well as the Russian Derby in his homeland. Anilin made two appearances in the Washington D.C. International in the United States, finishing third once to Kelso and second to Behistoun), Gazolin, Gazomiot, and the brilliant filly Etna. Then there was Zabeg (1957, descended zig-zag through Galtee More's son CHRONOGRAF (1903)), a strong, rugged specimen that competed in Russia, Poland, East Germany, Sweden, Norway, and the United States and then became the first Russian champion to stand stud in the West when he was purchased by American Elizabeth Whitney Tippett to stand first in Ireland and then at her Llangollen Farm in Florida. Of the daughters Galtee More sired in Russia, the most important were FIPPENOWA (1902), out of Weiter, by Kisber Öcscse dam of the Sac-a-Papier colt Lan, winner in 1912 of the Nagroda St. Leger at Warsaw; TEST (1903), dam of the Cheers filly Thesis, winner of the Priz Rieki Wolgi at Moscow; LIGIA (1901), dam of the colt Siam, winner in 1914 of the Nagroda Przychowku; and BRANGENA (1903), out of Beverly, by Strongian, dam of Brave Maid, a Matchbox filly that captured the Gagarinskij in St. Petersburg in 1911. 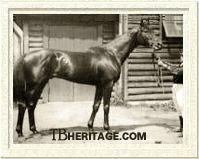 TREL (1905), out of Tradycja, by Triton, was noteworthy only as the ancestress of 1963 Russian Oaks winner Talija. Galtee More's new home in Germany was the Imperial Stud at Graditz. Already in residence in Germany was Galtee More's half-brother Ard Patrick. Both stallions proved invaluable to the German breeding industry. As in Russia, Galtee More proved an immediate success. The best performer Galtee More sired in Germany was undoubtedly FERVOR (1906). FERVOR was a member of Galtee More's first German-sired crop. His dam was Festa, by St. Simon out of Oaks winner L'Abbesse du Jouarre, making her a full sister to English stakes winner Desmond. Previously, Festa produced Festino, Fels, Fabula, and Faust, all of whom would become racecourse performers of the highest class for Germany. FERVOR would prove to be no exception. FERVOR was bred, owned, and raced by his breeders, the brothers Carl and Arthur Weinberg, and it was a their Gestüt Waldfried FERVOR was foaled. From the ages of two through five, FERVOR raced a total of fifty-seven times, winning nineteen times and placing a further thirty times. FERVOR won such major fixtures of the German turf as the Preis des Winterfavoriten, which he won as a two-year-old, the Henckel-Rennen and Deutsches St. Leger (dead-heated for the victory with the Ard Patrick filly Glockenspiel) at three, the Grosser Preis von Berlin at four, and the Goldene Peitsche at five. His total winnings amounted to 432,590 marks. His sire, Galtee More, led the German sires list the year FERVOR was a four-year-old. Upon his retirement from racing, FERVOR stood stud at his birthplace, Gestüt Waldfried. He was leading sire in Germany four straight years, 1923 through 1926. Four performers by FERVOR swept four of the major German classics in 1924-- Anmarsch captured the Deutsches Derby, Petunie the Kisasszony-Rennen, Ostrea took the Preis der Diana, and Hornbori the Deutsches St. Leger. He got eight more winners of nine German classic races, and many other high-class runners. His speedy son, Henckel-Rennen winner Favor, and his son Graf Ferry became good sires, but the male line of Galtee More through FERVOR died out when Deutsches Derby winner Solo, a grandson of FERVOR, failed to sire a good son. FERVOR was also dam's sire of four winners of five classic races in Germany and Hungary. FERVOR died at Gestüt Waldfried at the age of twenty-five in 1931. Another top mare brought to Galtee More's court was the Preis der Diana winner Belomantie, a daughter of Trachenberg and English Oaks winner Geheimniss. From this union came the chestnut filly KASSANDRA (1908). She was a classic winner in Hungary, capturing the Magyar St. Leger. At home, she took the Grosser Preis von Hamburg. Kassandra was not a success as a broodmare, and her branch of the Geheimniss family did not breed on. Orchidee The best filly Galtee More sired in Germany also proved to be his best producing daughter. This was ORCHIDEE II (1910, out of Orseis, by St. Serf). Her dam, Orseis, never raced, and in 1904, at the age of six, she was sold at the Newmarket December sale for only forty guineas. Her new owner was Baron Alfred von Oppenheim, member of the German-Jewish banking dynasty. Baron Alfred was master of the stud his father, Baron Eduard von Oppenheim, founded in 1869, Gestüt Schlenderhan, near Cologne. ORCHIDEE was described as having a "...long, light neck, high withers, soft loins and a pointed croup. Altogether she was very light and rather tucked up." Her light, yellowish chestnut coat only highlighted her physical flaws. Though she may have been unattractive, there was nothing wrong with her talent. Unraced at two, she put together a strong campaign at three, winning two classics, the Preis der Diana at Hoppegarten and the Deutsches St. Leger at Berlin. Her other victories included the Preis der Stadt Baden at Baden-Baden and the Waldchens-Rennen at Frankfort. As a broodmare at the place of her birth, Schlenderhan, her best was the colt by Prunus named Oleander, foaled in 1924. A fractured pelvis in a training accident after his promising two-year-old season nearly cost the colt his life. Careful nursing brought him back to the races, though necessitated the canceling of his classic engagements. Nevertheless, Oleander raced through the age of five, winning the Grosser Preis von Berlin twice, and the Grosser Preis von Baden three times among his nineteen career victories. Oleander acquitted himself admirably on the international stage, finishing fifth and third in the Prix de l'Arc de Triomphe at Longchamp as a four and five-year-old, respectively. As a stallion, Oleander was Germany's leading sire nine times with eight German classic winners to his credit. Oleander was broodmare sire of five German classic winners, two Österreichisches Derby winners, and a Belgian Derby winner. His son Orsenigo was a winner of the Derby Italiano and was twice leading sire in Italy. Exported to Brazil, Orsenigo did well there, too and placed second on both the sire lists of Argentina and Chile. Another son of Oleander, Pink Flower, was classic-placed in England and was the sire of several good stakes winners, including Wilwyn, winner of the inaugural Washington D.C. International in 1952 and South Africa's leading sire in 1964. ORCHIDEE'S other important representative was Odaliske. A year older than Oleander, Odaliske (1923) was sired by Aeiwl, a son of Galtee More's half-brother Ard Patrick. She was a stakes winner at two and classic-placed in the German One Thousand Guineas at three. Odaliske became the dam of Orgelton, winner of the Deutcches Derby and Henckel-Rennen in 1938, and Octavanius, winner of the Ouml;sterreichisches Derby and Deutsches St. Leger in 1939 and the Grosser Hansa Preis the following year. Galtee More sired a number of talented sons during his tenure in Germany in addition to FERVOR. INAMORE (1906) was out of Invergowrie, by Rosebery. As a three-year-old, he took the Frankfurter Gold-Pokal and the Waldschens-Rennen, both at Frankfurt and was third in both the Grosser Hansa-Preis and Oppenheim-Memorial. He continued to race through the age of five, at which age he was victorious in the Fels-Rennen at Hoppegarten. GOLF (1908) was produced from Galopin's daughter Glenayes. GOLF raced from the ages of two through four. He won the Falkenhausen-Memorial at Hoppegarten as a juvenile, the Frankfurter Gold-Pokal at Frankfurt and the Ard Patrick-Rennen at Hoppegarten at three, as well as finishing second to Hannibal in the Union-Rennen. At four, GOLF was a winner over FERVOR of the Badener Stiftungs-Preis at Baden-Baden. ECCOLO (1909), out of Preis der Diana winner Eccola, by Saraband, was a winner of the Horster Criterium at Gelsenkirchen-Horst at two, took the Preis der Mark at Hoppegarten at three and dead-heated for the victory with the Ard Patrick colt Octopus in the Borsteler Herbst-Pokal at Hamburg. At four, ECCOLO won the Fruhjahrs-Handicap at Hamburg and the Jubiläums-Preis at Hanover. Other German-bred stakes-winning sons of Galtee More included GUTFREUND (1906), out of Galopin Lass, by Galopin. GUTFREUND was one of the few Galtee More offspring to race in England when he won the Criterion Stakes at Newmarket as a two-year-old. SEESTERN, also foaled in 1906, was out of Seclusion, by Hermit. Seclusion was twenty-years-old when SEESTERN was foaled, having been sold to Germany several years previously. In England, she produced Lock and Key, by Janissary, whose daughter, Keystone II, would win the English Oaks the spring SEESTERN was foaled. Seclusion foaled the German stakes winner Sangerin in 1896, but her produce record was spotty and it was another ten years before the appearance of SEESTERN. His principle victory came in the Schwarzwald-Rennen at Baden-Baden as a two-year-old. FALTENFEX (1907), out of a mare named Falsetto, was a winner at two of the Hamburger Criterium at Hamburg and the Hahn-Memorial at Hoppegarten. At three, he was third in the Preis von Thuringen at Gotha and third to Ard Patrick's daughter Antwort in the Rheinisches Zucht-Rennen at Cologne. Then there was KREUZER (1909), out of Kirsche, by Hampton. Kreuzer took the Ratibor-Rennen at Hoppegarten at two, and placed in the Ard Patrick-Rennen and Heidelburg Handicap at three. MEISSEL (1910), out of Sensation's daughter Myakka, scored his biggest victory in the Grosser Preis von Hannover in 1912, run briefly as an event for two-year-olds in 1912 and 1913. None of these sons had a notable stud career. Galtee More's sons, both in Russia and Germany, were, with a few exceptions, far superior to his fillies on the racecourse. At stud, the Galtee More fillies turned the tables. DOGARESSA (1906, out of the Isonomy mare Domiduca) was foaled in Russia, conceived just prior to her sire's departure for Germany. She made no mark on the racecourse, and wound up in Germany as a broodmare. To the cover of Galloping Lad, she produced Drosselbart, winner of the Bayerisches Zuchtrennen at Munich and Gondel, a Nuage colt that was victorious in the Jubiläums-Preis at Hanover in 1920. 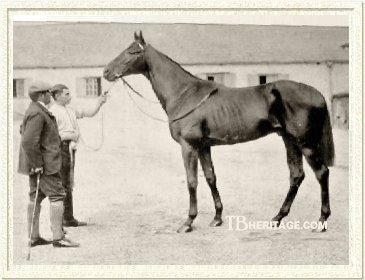 DOGARESSA'S daughter, Harfe, by Dark Ronald and foaled in 1918, took the Deutscher Stutenpreis at Hanover as a three-year-old and then became a successful producer herself, as daughter Note, by Nuage, captured the Preis der Diana in 1926. Note became the dam of the Prunus colt Unkenruf, winner in 1933 of the Furstenberg-Rennen at Baden-Baden, second to Alchimist in the Deutsches Derby and third to that rival in the Grosser Preis von Berlin the same season. Galtee More's daughter, PRIGNITZ (1907, from Princess Patti, by Royal Hampton) was the dam of two Austrian stakes winners. Her claim to fame rests on daughters Adomany, a chestnut filly by Adam that was victorious in the Graf-Hugo-Henckel Memorial as a two-year-old in 1917 and Apro, a bay filly by Ossian that won the Österreichisches Stutenpreis as a three-year-old in 1922. Adomany had no recorded progeny, but Apro became the second dam of the Hungarian colt Puczur, winner in 1939 of the Magyar Derby. Another Hungarian stakes winner produced by a Galtee More mare was Schalk, by Icy Wind out of INDISCRETION. Schalk won the Trial Stakes at Vienna in 1919. MOSEL (1911), out of Mosul, by Bona Vista, was the dam of Vysehrad (1924), a colt by Sanskrit that won both the Alagi dij at Budapest and the Ouml;sterreichisches Derby in Vienna at three in 1927. MONTANA II (1912, out of Magda, by Enthusiast) was a winner once in nine starts. She was the dam of Marduck (1922, by Anschluss), a winner of the Hoppegartener Jubiläums-Preis at three and the Rennard-Rennen at Hamburg at four. Marduck raced several times against the talented Dark Ronald filly Aditi at three and four, and was never able to beat her, though he gave courageous efforts when finishing second to her in the Gladiatoren-Rennen at Berlin at three, and the next season finishing second to her in the Podbielski-Rennen at Berlin, third to Indigo and Aditi in the Jubiläums-Preis at Hoppegarten, and third in the Grosser Hansa-Preis at Hamburg. Marduck was not a successful sire. IRISH GAL (1913), a chestnut out of Ibidem, by Little Duck, was classic-placed, running third to the Nuage filly Adresse in the Preis der Diana. As a broodmare, her best was the Prunus colt Indigo (1923), winner of the Grosser Preis von Baden and Hoppegartener Jubiläums-Preis at three in 1926. FRANCESCA DA RIMINI (1909) was another Galtee More daughter out of a Royal Hampton mare, that being Royal Footstep. FRANCESCA DA RIMINI'S best stakes showing was a second to the exceptionally fast filly Flagge in the Stuten-Biennial at Hoppegarten. At stud, FRANCESCA DA RIMINI produced Kardinal, winner of the 1923 Hertefeld-Rennen at Hoppegarten and Malatesta, winner of the Sachsen-Preis at Dresden in 1925 and third to FAVOR in the Henckel-Rennen (German Two Thousand Guineas). In addition, FRANCESCA DA RIMINI was the second dam of Rochus, two-time winner of the Goldene Peitsche sprint. A year younger full sister to FRANCESCA DA RIMINI was RESEDA (1910), winner at two of the Schwarzwald-Rennen at Baden-Baden. Reseda had no recorded progeny. Royal Footstep also produced the filly REGINA CASTRA to the cover of Galtee More's half brother Ard Patrick. She was third to the Ard Patrick filly Letizia in the Preis der Diana of 1910, a race that saw the first three finishers sired by that stallion. ASKANIA (1911) out of Princess Heiling, by Hans Heiling, was second in the Preis der Diana to the Saphir filly Mon Desir. Her best racetrack performer was the Dark Ronald colt Falsum (1921), winner at three of the Hoppegartener Jubiläums-Preis. DIFFERENZ (1914), produced from the Donovan mare Donna Caterina, scored her biggest victory as a two-year-old in the Frankfurter Goldpokal at Frankfurt. Her best produce was the German stakes winner Drachme. Galtee More died at the age of twenty-three on January 30, 1917. The stallion was being transported from Graditz to the Hoppegarten near Berlin, to take up residence at the Union Stud. Galtee More slipped on the platform after being unloaded and one of his legs broke when it became trapped between the platform and the railway carriage. There was no alternative but to shoot him on the spot. It was an unexpectedly tragic ending to the life of a horse whose name renowned in three countries -- Triple Crown winner in England and leading sire in both Russia and Germany. The Germans at least had some solace over the loss of Galtee More in the fact his half-brother, Ard Patrick, leader of the German sires list on four occasions, was still going strong. Galtee More gave the Russian thoroughbred a huge boost in a country where trotters reigned supreme in popularity. The progeny of Galtee More, so dominant in the classic races of Russia and Poland, were some of the most talented performers to race in Russia to that time. Even though the British excursion of Galtee More's son, HAMMURABI, did not achieve the lofty results the Russians hoped for, the fact still remains that the Russians were never before then so confident in sending one of their runners to compete in the West. Despite having to part with Galtee More due to the political climate of the time, the success he achieved as a sire in Russia paved the way for the increased number of importations of top quality bloodstock from England and France in future years. As a sire in Germany, from the year when his first German-sired progeny hit the races through the season prior to his sudden demise, Galtee More stock won 309 races and nearly £110,000 in prize money. In 1912 alone, Galtee More performers won 54 races in Germany and over £23,300 in prize money. Galtee More, his son FERVOR, and grandson Oleander between them led the German sires list fourteen times. Galtee More's influence on the German thoroughbred was profound as a result. --Elizabeth Martiniak. Special thanks to Bettina Fuchs for her assistance. ©2011 Thoroughbred Heritage. All rights reserved.